A friendly village congregation with an interest in the healing ministry. On street parking outside the Church, no parking restrictions. Access ramp at north door of Church. An induction loop system is installed. Services: Every Sunday at 10.30 a.m. with Junior Church during school term time, and at 4pm on the third Sunday of the month for families at 4. United service at Cherryfields at 3.00 p.m. on third Sunday each month. Women’s Network at 2 p.m. on second and fourth Tuesday from October to April and on second Tuesday from May to September. Prayer and laying on of hands for healing: second Wednesday each month at 7.30 p.m.
House Groups meet regularly, one in the morning, one in the afternoon and one in the evening at different locations on different days of the week. 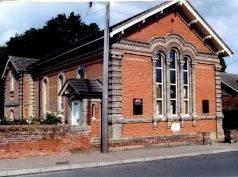 Computer Club on Mondays, 7.30 – 9.30 p.m. and Wednesdays from 10.00 to 12 noon.